'This welcome new book of John Watson's jazz photography is an impressive tribute to his ability to get up close and personal, to capture the moment and to delight in experimentation too. His collection opens with 'motion' pictures, near-abstract studies that seek to convey an impression of jazz and its aura. 'They culiminate here in a remarkable series portraying a red-shirted Sonny Rollins in full flight. That's another characteristic of Watson's work - he likes to present sequential images, as in his observation of composer Mike Gibbs at work with Bill Frisell and the BBC Symphony Orchestra. There's a similarly remarkable series of guitarist Jim Mullen, nine frames on the page, each conveying his change of expression as a solo unfolds. Watson is clearly at one with contemporary trends, too, so for every Hank Jones shot there are others of Neil Cowley, Gwilym Simcock or Stefano Bollani. 'Whether you know it or not you're probably already an admirer of the work of photographer John Watson, whose images regularly appear in Jazz Journal. While almost anybody with a camera can adequately document an event, only the very best capture the essence of what Henri Cartier-Bresson famously described as the "continually vanishing" subject. 'With a combination of technical prowess and an obvious passion for jazz, Watson produces images that are invariably pregnant with the atmosphere and energies of the moment as he brings the subjects' occasionally idiosyncratic traits into vivid life. 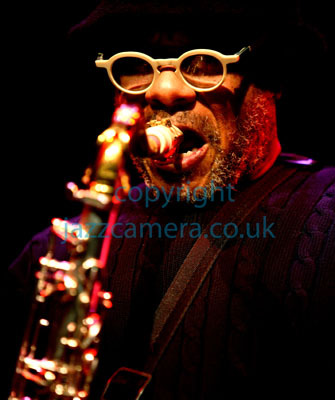 'I can't think of another collection where iconic legends such as Sonny Rollins and Herbie Hancock rub shoulders with British mainstreamers like Dave Green and Tommy Whittle, or in which contemporary stars like Bill Frisell and the late Esjborn Svensson share equal billing with emerging talents such as Soweto Kinch and Zoe Rahman. 'Several candid behind-the-scenes shots capture subjects in relaxed and intimate moments, whilst the book's heavy grade paper and quality inks do full justice to Watson's work. 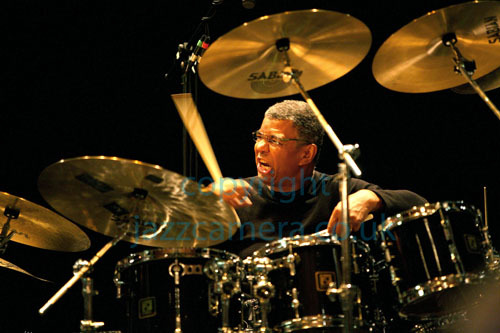 'He is clearly a photographer with a personal style, and his striking portrait of Jack DeJohnette amid a swirling vortex of movement is one of several shots using in-camera tricks to dramatic effect. 'John Watson captures his musician subjects with an alert and sensitive eye. His passion for the music has taken him to leading venues in New York, London, Birmingham, and way beyond, to photograph its leading exponents. 'In the second edition of his book The Power Of Jazz, Watson takes the reader through images arranged by the instruments played. A section on keyboards has Chick Corea and Herbie Hancock on one double page spread, in relaxed and concentrated modes respectively, and the book ends with sections on big bands and the filming of live concerts. 'Watson gets remarkably close to his subjects without any evidence of being intrusive, and skilfully - and deceptively effortlessly - captures the essence of each of their personalities, stage persona and technical approaches. 'There are many excellent shots which stand up on their own as portraits, as well as records of an event. It is worth noting, too, that Watson, in his pursuit of the honestly envisioned image, resolutely eschews computer manipulation of his photographs, so this portfolio is all 'live and direct' from the camera. 'These include: a trio of stunningly stark, elegant photographs of Carla Bley, a sequence showing the octogenarian Sonny Rollins in full flow at the London Jazz Festival; a moment of laughter with New York saxophonist Carol Sudhalter at the canalside; a thoughtful, pensive Arve Henriksen; an enigmatic monochrome portrait of Tomasz Stanko; a razor sharp Pat Martino; and Stan Tracey beautifully captured with a half glance at Watson. 'There's a lovely spread, in black and white, with Stanley Clarke on upright bass, complemented by a haunting image of Henry Grimes, head tucked behind the fingerboard, caught with a look halfway between an assertive twinkle and deep poignancy, a window into the soul perhaps.